I work at an arts integration magnet school. We’re all at various levels of comfort with our art integration and I am often looking for new and different ways to incorporate the arts into our day. Part of our job as classroom teachers isn’t just to have the arts present in our classroom, but to also teach relevant concepts with the arts. I have learned a lot in my first couple years in this building, and I know the more I incorporate and the more I try to learn new concepts and strategies, the stronger I’ll become with it. I have a long way to go, but this project we did on Halloween is one I’m quite proud of. I saw this post from Tales from a Very Busy Teacher and I modified it to include additional math skills. We did it in two parts on Halloween. We did the painting in the morning and then the rest in the afternoon after our pages our dry. I gave each student white paint and blue paint on a small paper plate. Students drew a white circle in the top corner of their white construction paper. Students who wanted to their backgrounds to be purple also got red paint and then mixed the red and blue to make purple. This resulted in every student having a different color purple bringing some authenticity to their work. Then using just the paint on the brush from mixing (or grabbing just a dab of paint if students used blue) students mixed the color into the white to create a very light shade. We talked about how just a little bit of colored paint would drastically change the white color. Students then created a ring around their white moon. We did that 3 times, each adding just a little bit more blue to the shade. As we got further down the page, we added more of the dark color in each mix. We talked about how the gradient would change faster. When we got to the bottom of the page, we switched gears. Students used the darkest paint at the bottom and then we combined the two to mix the top and bottom. We talked about shading and how we wanted the color change to be more subtle on the bottom so we used our brush (with no additional paint on it) to blur the lines. In the afternoon students were given 3 black construction paper rectangles and we discussed how we could make towers and the base of a house using a square. We also took the construction paper to free cut triangles. I showed students how they could make triangles out of squares and rectangles. 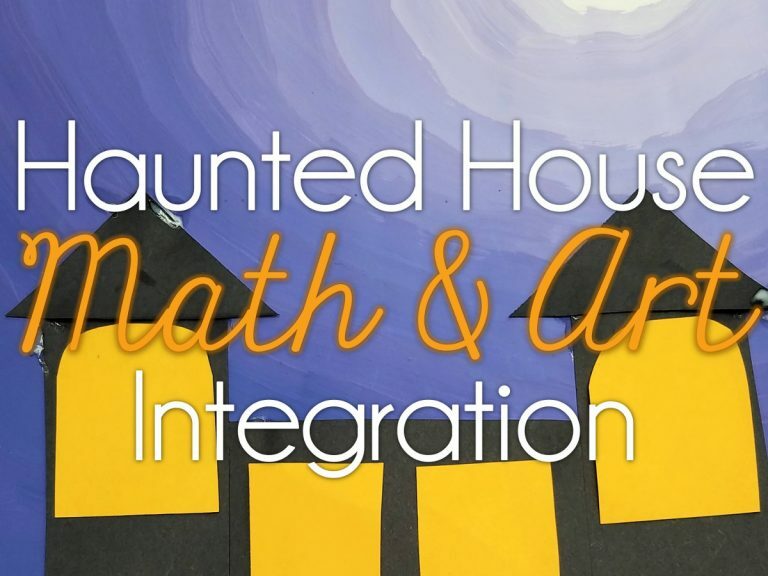 I passed out yellow pieces of paper for students to create windows in their haunted house. I showed students how to round the corners of their rectangles if they wanted to create rounded windows. Using Sharpies, students created birds in their scenes. I showed students how to make a bird using a stretched “m” and students did a great job trying it out. Each students’ scene is just a bit different, making it a great art (not craft) project. The week before students were trying to write story problems as part of our math problem solving unit, but were really struggling with it. I told students to make their own number of birds and we talked about how that would be the number remaining in their story problem. I modeled writing the story problem (and it also helped with grammar and spelling for the students’ work) and we talked about how we could represent a some, some went away problem with the birds. I love the way these turned out. It was a great way for us to practice our math work, introduce and discuss some topics we won’t get to until much later in the year, and have a change in routine, but not too chaotic, on Halloween. I also love that this project brought in some differentiation both on the art and on the math side of things. Students chose the number of birds they wanted to use. Those unconfident students just used the information from my model. Others applied numbers they’re comfortable manipulating. And others, like the kiddo who worked below, pushed herself to work with a much higher number. She kept it at -1, but I was proud to see her working to push herself. This will probably continue to be what I do on Halloween, or the weeks before, for several years.